WASHINGTON (CNS) — Pope Francis’ call to Christians to examine and reconsider the way they treat others brings challenges for Catholic publications in combatting polarization within the church, said a panel of editors and publishers Oct. 16. The editors of Commonweal, First Things and America magazines, and the presidents of the National Catholic Reporter (NCR) and Our Sunday Visitor (OSV) newspapers acknowledged that their publications represent a spectrum of what are perceived to be conservative and progressive approaches to Catholicism. Despite representing a wide range of readers, the panelists raised common problems in reporting on Pope Francis, including that too few Catholics are well versed enough in the church’s teachings to understand what he says in context, and that Americans tend to think of every issue as a win/lose proposition between two opposing sides. Caitlin Hendel, president and CEO of NCR, said she has found that “covering the Catholic Church is not that different from covering Congress … you’re always trying to cover two sides… that are both trying to own the story.” That has happened with reporting on the Synod of Bishops, she said, with the two-week discussion on family life being covered as if it’s a political debate. At the synod, Hendel said, the debate became the story, yet the message Pope Francis has given over and over is that “we don’t have time” to get caught up in debates, that “these other stories are distracting us” from doing the work of reaching out to the disenfranchised and caring for the needy. 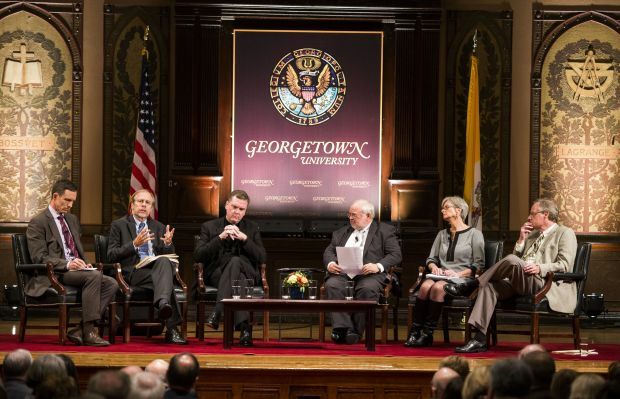 The range of Catholics who make up the target markets for the publications was described by the program’s moderator, John Carr, director of the Initiative on Catholic Social Thought and Public Life at Georgetown. America magazine is not typically identified as falling on either extreme of a political spectrum. NCR was founded during the Second Vatican Council by journalists who wanted a stronger voice for laypeople supporting change in the church. Our Sunday Visitor traces its origins as a counter voice to a popular anti-Catholic publication early in the 20th century. Commonweal is a lay Catholic journal of opinion. First Things was founded “to advance a religiously informed public philosophy for the ordering of society,” as the event’s program described it. The panelists agreed that the pontificate of Pope Francis has been accepted by their readers in different ways — some with glee, some with nervousness and some with confusion. All said that no matter how their readers react, they find that in covering Pope Francis they sometimes take guff from their own usual supporters. He explained that the magazine was founded as the Soviet Union was crumbling but socialism still seemed a viable form of government, which alarmed its strongly capitalist founders. But the world is now different, Reno said. Carr steered the panelists to discuss what responsibility they have in fighting polarization. Gregory Erlandson, president and publisher of OSV, focused on inadequate religious education as part of the problem. His publication was founded to educate Catholics about the church, he explained and it still takes that need seriously. “Catholic journals and periodicals are the only widespread form of faith formation in the country,” Erlandson said. Recent polls show only 15 percent of Catholic elementary school children are in Catholic schools, and only 5 percent of Catholic high schoolers are. Doing a better job of educating Catholics about their own church’s teachings can go a long way toward cutting down on polarization, he said. Jesuit Father Matt Malone, editor-in-chief of America, said that in times when demographics are “sliced and diced” to hit a narrow target market, any kind of Catholic journal “is going to be countercultural and is going to be edgy” because Catholic teachings and Christian discipleship cut across how people self-identify. Other policy matters also raise questions of prudential judgment, he said. The magazine recently ran complementary pieces in which Rep. Paul Ryan, R-Wis., and Rep. Joe Kennedy, D-Mass., discussed Pope Francis’ call to empower the poor. I found the reporting of this panel discussion at Georgetown to be very interesting and enlightening. It causes me to pause and think – are there healthy alternatives to polarization for the sake of the common good? Certainly Catholic magazines and periodicals can take a lead in setting this example. I applaud CatholicPhilly.com for featuring articles such as these and would encourage you to continue to do so.